Paul Cook insists he still harbours hopes of seizing automatic promotion. Pompey may have secured their play-off presence in the week, yet the manager is looking higher. The Blues are five points adrift of third-placed Oxford United with two matches remaining. Accrington, who occupy second spot, possess a six-point advantage, yet inferior goal difference. Bristol Rovers and Plymouth must also slip up for Pompey to stand any chance of clambering ahead of them for the final two promotion spots. In addition, Cook’s men have to pull off victories over Hartlepool tomorrow and then runaway champions Northampton. It represents a massively unlikely outcome for Pompey to sneak into the top three at this stage of the campaign. Yet Cook retains the belief. He said: ‘Why can’t we do it? ‘Until it is mathematically impossible I won’t give in, not a chance. Not a chance. ‘Certainly not in this league. ‘If we can go into the final game with one place up for grabs and there is still a chance for us I will keep believing. ‘Football is the funniest game in the world. ‘Accrington have 81 points and Oxford are on 80. If they both lose tomorrow – and we win – they will go into the final game knowing if they lose again and we win then they won’t go up. Elsewhere among the promotion hopefuls, Accrington travel to Wycombe, while Oxford make the trek to Carlisle. Bristol Rovers, who lie only one point off the automatic spots, travel to relegated York City. As for Plymouth, they will journey to a Cambridge United side desperate for victory to boost their slim chances of making the play-offs. 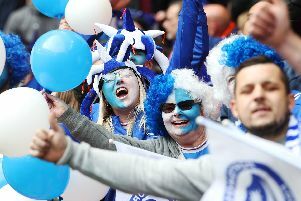 All four fixtures would need to turn out in Pompey’s favour for hope to remain into the final match of the season. In the meantime, Cook will be fielding his strongest side possible to ensure Pompey can apply pressure – and then be ready to pounce. He added: ‘I was worried on Tuesday morning that if we lost 5-0 in our last three games and Cambridge won both then we wouldn’t be in the play-offs. ‘Now I’m looking at it differently. ‘We will continue looking to win matches going into our final two games. ‘Imagine if we draw tomorrow playing a weakened team and everyone gets beat – you can’t rewind and say “Let’s bring the lads in and play a strong team”.